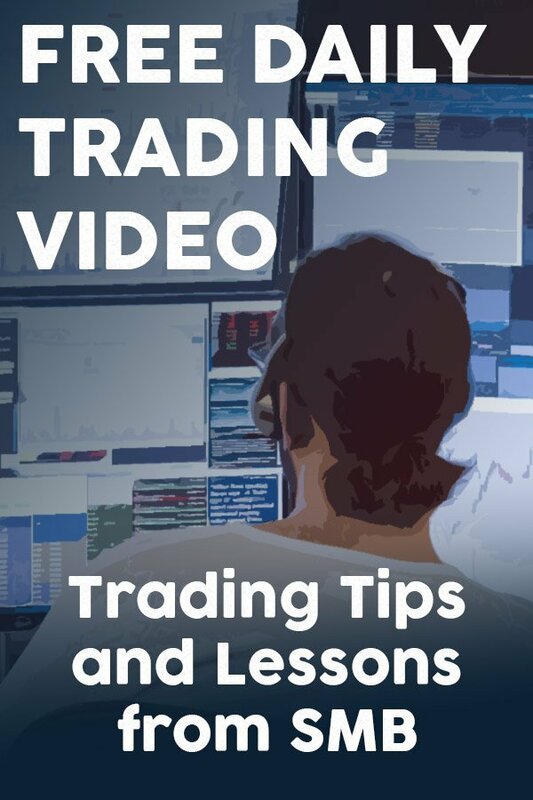 SMB Training Blog Traders ask: VWAP? Matt, one of our remote traders, asked me to write a short article on VWAP. Well, technically I’m on vacation, but I’ve been on hold with Continental Airlines for the past two hours trying to reschedule my flight back to the city… and I just beat my airport video game for the second time (kind of ironic, no? )… so I really have nothing else to do. 🙂 Here it goes. The average price for this period is 49.88, which would be the value we would get from a 5 period moving average. To calculate VWAP, each price is multiplied (read: “weighted”) by the volume done at that price, these products are added, and then divided by the sum of the volumes for the period under consideration. Pretty standard stuff as far as a weighted average goes, but just to check yourself, see if you get my answer of 49.62 for the example above. Take a minute also to make sure you understand why the VWAP is lower than the simple average… in this case, more volume was done at the lower prices, pulling VWAP lower than the simple average. I know a lot of people like to do things like consider VWAP over X day windows, with the idea that the relationship of price to VWAP shows you how far out of the money traders who executed at a certain point are. Honestly, this type of analysis has never really made sense to me because it assumes first of all that everyone is thinking about the market like short term traders. If a mutual fund is making an incremental adjustment to an exposure, do you think they care that they are now three points “out of the money”? Anyway… isn’t it also reasonable to assume that traders are in the money from the same point as well? I have just never really been able to extract useful information from that line of thinking. From a practical standpoint, if you calculate VWAP, you want to do it on the shortest timeframe possible because otherwise you will lose some resolution. I have three versions of VWAP available during the day: 1) a number published by my data provider (I know from past experience that this matches the VWAP on the RediPlus platform exactly… so I’m inclined to consider this one the “real” VWAP.) 2) one I calculate on one minute bars and 3) one I calculate on five-minute bars because I monitor about 24 stocks on a big screen of five-minute charts. I see that the #1 and #2 are usually exactly the same, though they can differ in the morning. Number three may be significant different, so just beware of this if you choose to calculate the number yourself. I would tend to ignore VWAPs you calculate on 10 minute or higher bars. Now… how to use VWAP. First of all, I dont make any mechanical trades off of VWAP, but one I think you can make (haven’t really run the numbers to prove it) is to buy the first retracement to VWAP after a strongly trending stock makes a new high of the day. Reverse for shorts. (Every part of that sentence in bold is important. If you ignore any part of it (for instance, buying the second or later pullbacks) I think you could be in trouble.) You could also use this as a profit target if, for instance, you bought a stock on a fade at the lows and are wondering where to take most of your sells… VWAP is likely to be a source of natural selling pressure so I would lighten up there. The chart above shows how I tend to use VWAP, which is more to give me insight into how a stock is trading. If a stock is chopping back and forth on both sides of VWAP, obviously VWAP is not really significant so I can safely ignore it. 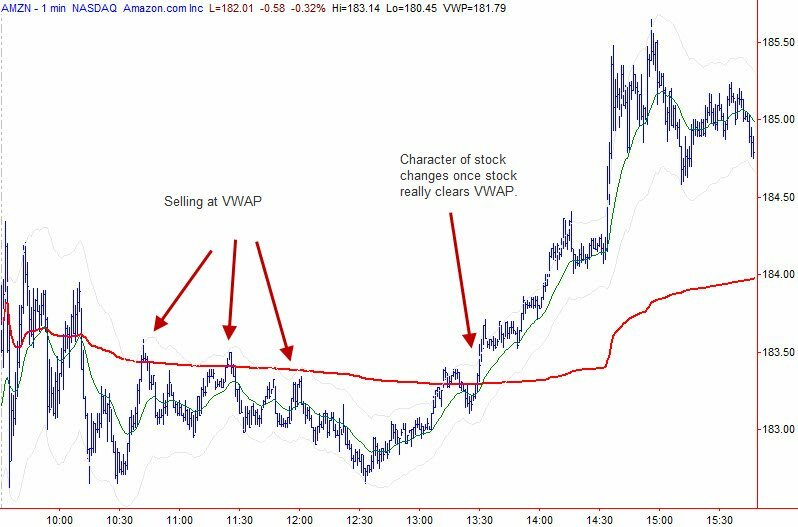 But… look at the chart of AMZN above and note that there was selling at VWAP each time price touched… and then finally those sellers lost the battle and the character of the stock was completely different. There are a lot of ways you could have used this information, but if you were short and pressing shorts, the momentum through VWAP should have warned you that you were fighting on the side of the losing army. 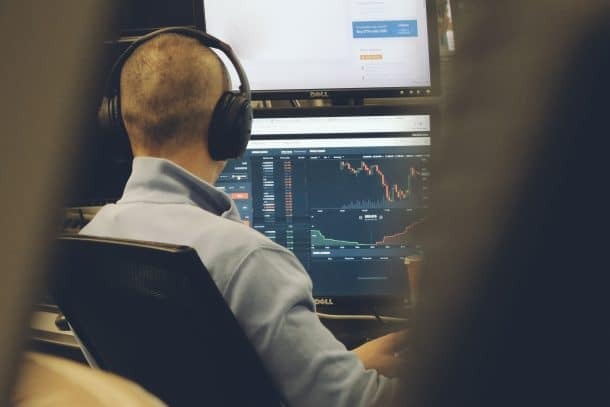 This was not intended to be an exhaustive article, but I hope it gives you some ideas and guidelines that you can incorporate in your own trading. Not much literature can be found on the topic and you sir have produced an excellent article. Thank you. I agree with ATB, I’ve never been able to understand what vwap actually is so i never used it. I guess it does have some relevance. Thanks for such a great article. How do I add a one minute VWAP indicator for tradestation? I don’t even see a VWAP plot option in the indicator section.